Disconnect from current WiFi connection, and connect ethernet cable. 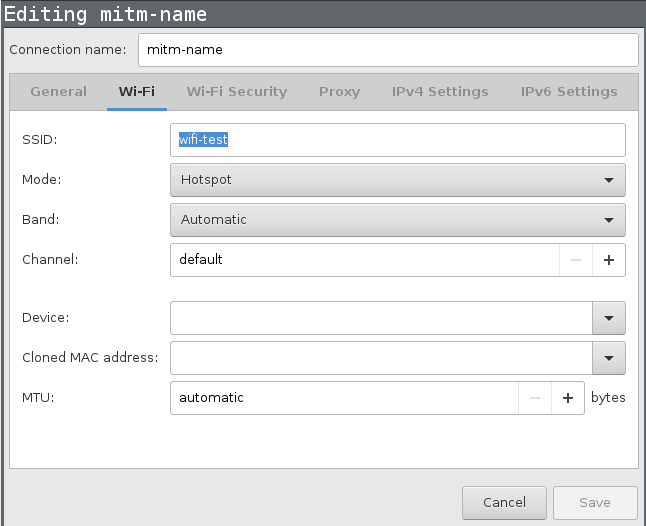 Name your SSID mitm-something, Mode should be hotspot. You should probably also add a WPA2 password. # iw list | grep -A 10 modes:  # is there "AP"? Network Manager or similar managers must not be running. Your upstream (internet) interface is eth0, and AP interface is wlan0 (change these if needed). Download hostapd.conf. 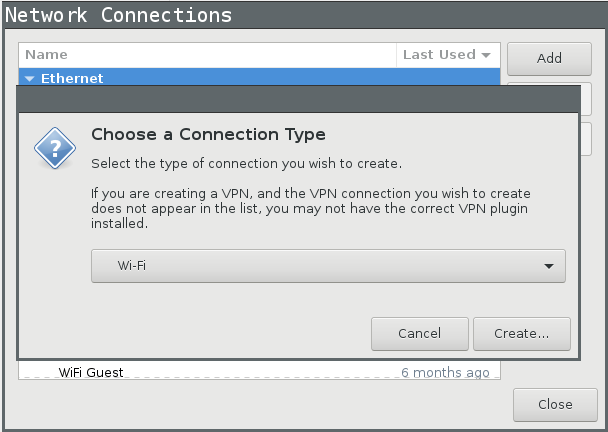 Change interface, ssid and wpa_passphrase. I’ll use subnet 192.168.11.0/24 here. Change everywhere if you intent to use something else. Just giving client the IP is not enough, you also need to set up IP forwarding, and rewriting (upstream routers don’t know about your $apnet). WiFi router is configured as a plain router, and will serve as WiFi AP. Its WAN port is connected to ethernet of your laptop (your laptop is upstream for the WiFi router), and your laptop is connected to WiFi (that’s your laptop’s upstream). Two WiFi cards - follow instructions above, but use second wlan interface for upstream instead of ethernet. One WiFi card - find a guide for manual setup online. I find this a bit unreliable. Good luck! If you have a firewall, you may need to allow connections to :8080. On your phone, go to http://mitm.it/ and download the CA certificate. /usr/share/doc/mitmproxy/examples/upsidedownternet.py Very useful for apps (quickly visible where content is downloaded with plain HTTP)! mitm_workshop is maintained by domenpk. This page was generated by GitHub Pages.